Posted by B. Daniel Blatt at 10:48 pm - November 3, 2012. Over at Maggie’s Farm, Bruce Kesler provides a partial list of the nearly 500 retired senior military officers who are placing an ad Monday in the Washington Times indicating their support for Mitt Romney’s White House bid. And that is not the entire universe of military leaders backing Mitt. Kesler knows “two former top Admirals who wanted to sign but were not reached”. Still, he reports that this is the “largest assemblage” ever of retired top military leaders organized to back a presidential candidate. By contrast, only 5 former generals and admirals are backing Obama. That’s almost a 100 to 1 margin. Posted by B. Daniel Blatt at 10:24 pm - November 3, 2012. That is consistent with what we’ve seen in polls across the nation, Romney enjoying a leading among independents. Given Obama’s negative closing message — and Romney’s upbeat one – it seems that those yet to decide are more likely to break for the challenger. Via Alexander Marlow at Breitbart who reminds us that “Democrats felt it necessary to send top-surrogate Bill Clinton to the Land of 10,000 Lakes earlier this week, and [that] Paul Ryan will be campaigning there tomorrow. Posted by B. Daniel Blatt at 10:01 pm - November 3, 2012. Posted by B. Daniel Blatt at 6:15 pm - November 3, 2012. Make sure to check below the jump as I’ll be updating with pictures as Clayton sends them. 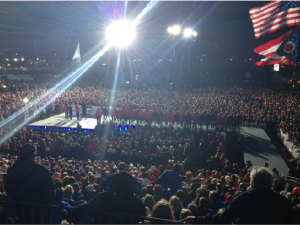 Looks like the crowd is already bigger than each of Obama’s recent Ohio rallies. Many polls try to measure enthusiasm by asking respondents about the excitement. The real gauge, however, is not in questions answered, but deeds performed. If people are willing to give up an afternoon — or a day — to attend a political rally then that shows real commitment and suggests they represent a groundswell for their candidate. We certainly saw that for Obama in 2008; we seem to be seeing that for Mitt Romney this week. Posted by B. Daniel Blatt at 6:00 pm - November 3, 2012. Our reader Kyle Raccio alerted us to a story perhaps indicating a preference cascade toward Mitt Romney. Gigi Georges, a long-time aide to both Bill and Hillary Clinton, has announced her support for Mitt Romney.
. . . during that time, I saw firsthand what can be accomplished by strong, bipartisan leadership. I know what it means to work across the aisle on issues that are important to the American people. And that’s why I am supporting Mitt Romney. Governor Romney has a plan to restore the prosperity this country deserves and expects. He will work with people of good will no matter what their party, and he will pursue the policies that are in the best interest of our country, no matter who proposes them. That’s what President Obama promised to do four years ago. But like so many of his promises, bipartisan cooperation is just another one he has broken. We can’t have four more years of failed policies and two parties that can’t work together. We need the change Mitt Romney is offering. Prominent Democratic woman backs Mitt Romney. Wonder if this is a sign that others might follow — or might already be souring on their fellow partisan. Posted by B. Daniel Blatt at 4:29 pm - November 3, 2012. From his first appearance on the national stage, his key-note speech at the 2004 Democratic National Convention, Barack Obama has cast himself a post-partisan figure who could transcend the polarized politics of the past dozen years or so. That image was central to his appeal in his 2008 bid for the White House — and likely caused many wavering centrist voters to shift their support to him in the campaign’s closing days. This was the first of his many partisan retorts. And the partisan pugnacity that defined his presidency would define his reelection campaign. At least since August 2011, his campaign aides made clear that their reelection strategy would focus on destroying the then-likely (and now-current) Republican presidential nominee. Obama is closing the campaign the same way he began it — on a negative note. Parts of his speeches sounds like they’ve been recycled from the 2008 campaign, as if he’s still running against George W. Bush, only he has sharpened his attacks. He attacks his opponent as a stand-in for the former president, strongly suggesting that, nearly four years after the Texas Republican left office, he’s still responsible for incomes which declined and deficits which increased under Obama’s watch. And then yesterday, he asked his supporters to vote, not out of love for country but out of revenge. Voting for emotional satisfaction or economic growth*? Posted by B. Daniel Blatt at 5:11 am - November 3, 2012. Posted by B. Daniel Blatt at 3:31 am - November 3, 2012. In West Chester, Ohio yesterday, the local Fire Chief estimated that over 30,000 supporters gathered to hear Mitt Romney offer his pitch for real change. That roughly three times the combined total (10,600) at Obama’s three rallies in the Buckeye State yesterday. Ace and Twitchy have more images from the rally. And each of these 30,000 Ohioans had to arrive early at the rally and pass through security, that is, their presence there showed an incredible amount of commitment. And this, John Hinderaker reminds us, is par for the course for the Romney/Ryan ticket: “They draw large, excited crowds pretty much everywhere they go.” “The enthusiasm gap,”, as John puts it, favors the GOP. 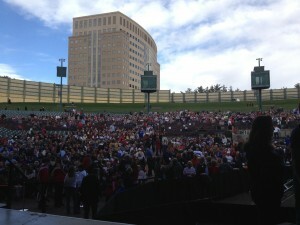 An AP reporter, Stacy McCain reports, is trying to lowball the crowd size. A more honest journalist reported that he didn’t “even know how to take a picture of” the crowd because it was so big. Hopefully, local news will provide more reliable coverage of the rally. CHANGE: Obama Attracting Smaller Crowds than McCain in 2008. UPDATE: Obama’s Cleveland Rally Attendance 20x Lower than 2008. UP-UPDATE: There were 4,000 this morning at Obama’s Cleveland rally, meaning the tally at four of Obama’s Ohio rallies combined was less than half that at one Mitt Romney Ohio rally. Posted by B. Daniel Blatt at 2:18 am - November 3, 2012. We’ve tried the other folks’ ideas. They don’t work. The eight years before I took office, we tried their ideas. What did we get? We got falling incomes, record deficits … and an economic crisis that we’ve been cleaning up after ever since. Falling incomes? Record deficits? Sounds like what we got those things when we tried Obama’s ideas. So, please tell me exactly how Obama’s ideas worked. Federal debt increased more in his (still uncompleted) first term than it did in both George W. Bush’s terms. The unemployment rate is higher than it was the day he took office. And much higher than the rate forecast by his team of economists when they pitched his “stimulus.” The economic recovery is the slowest since the Great Depression. It’s as if the neophyte challenger running against an incumbent president. He’s not running on his record; he’s still running against George W. Bush. And if George W. Bush is still responsible for today’s problems, then, well, Mr. Obama hasn’t been a very effective chief effective. . .